This weekend, the Pirate and I went down to go see his parents in LA. The girls stayed here with Ex #3 so that we could load up the truck with the furniture the Pirate's parents wanted us to bring up. Another bookcase, a small kitchen island (this makes two) and a load of small item of heirloom silver and glass. I'm a little uncomfortable about the heirlooms, mostly because my children are not the Pirate's and it seems unfair to take these things out of the family by giving them to us. My conscience was eased by the Pirate's assurances that should either of his two cousins get married and/or have a family, we could pass them on to them. We came home and immediately took the Baby Goddess out to see Madagascar. My hopes weren't high, so I wasn't disappointed. It was cute. We came home and the Baby Goddess and I went on the hunt for the source of the big, black, biting ants marching across our deck. Armed with a large container of diazinon (me) and a water spray bottle (her), we followed the ants to a forbiddingly huge nest under our deck. We sprinkled and sprayed and I found a stand of mushrooms under the deck. I plucked one that was about 4" high and brought it inside. 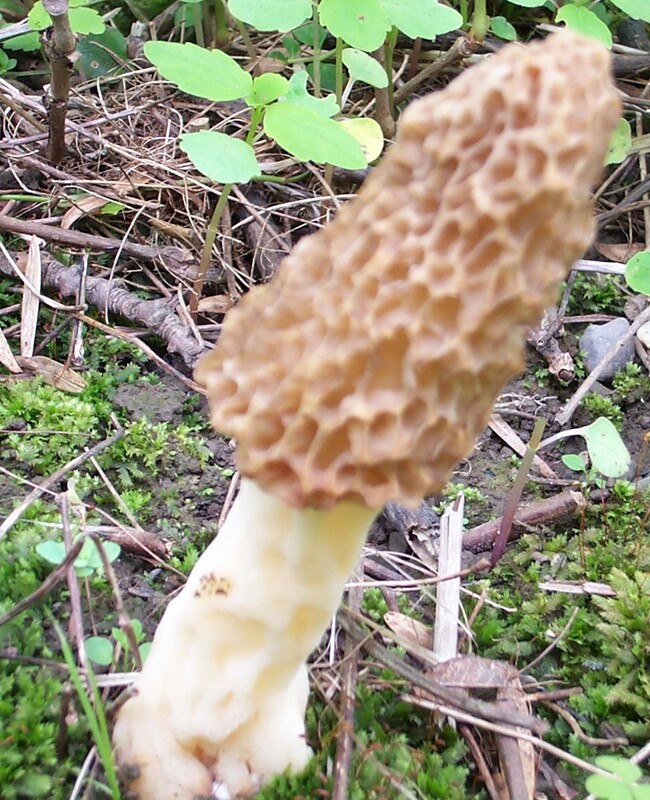 A few minutes with the Audobon Field Guide to North American Mushrooms, and I think we've identified it. We have morrels growing under our deck. Considering that when you can get them in the store they can be upwards of $20/lb, I'm feeling sort of cautiously triumphant. Just be 100% sure what that mushroom is before you eat it! There are lots of toxic ones up in the hills that look just like edible ones. Now that I'm in a house again, my mom seems to be calling me every day, "Do you want this back? How would you like that?" Ugh. I try to explain that I'm just renting, I don't want to start accumulating stuff again! But with her chemo meds, she is confused and a little spacey, so I'm trying to let it go. We looked it up. Morrels don't look like anything else. Our mushroom book gives other things that it could be mistaken for, especially poisonous mushrooms. The ones that looked closest to a morrel weren't close at all. After we decided it was definitely a morrel, I tried a tiny slice of it. That was last night, and if there are no abdominal cramps, diarrhea, nausea, vomiting, etc. within 24 hours, we're good. When I tasted it, it tasted like morrel mushrooms I've bought, so I'm sure.